Purple coneflowers are impressive plants with striking blooms atop a tall stalk. These daisy-like petals open and fold backward exposing the dominant orange center. Once established, echinacea returns year after year and spreads to cover a larger area. As an ornamental plant it creates a focal point in any flower garden and attracts a host of flying insects like butterflies and moths. It even attracts the attention of hummingbirds, too. Select a sunny location for purple cone flowers. An area that receives 6 to 8 hours of direct sunlight a day is ideal. 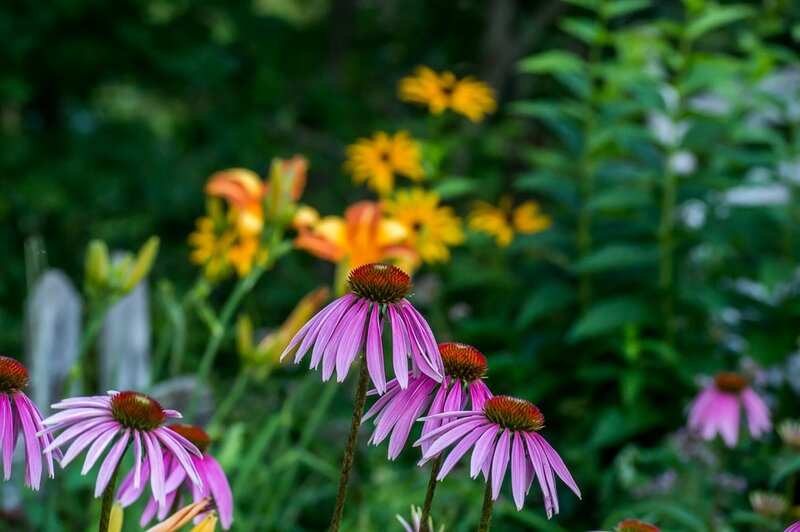 Although they may survive in a shadier area, echinacea loves the sun and does best when planted in an area that receives plenty of afternoon sun. Start echinacea purpurea from seed in the early spring. These hardy plants withstand spring frosts and are often several inches high before other flowers emerge in the spring. Scatter seeds on well cultivated soil and cover lightly. Keep the soil moist until seedlings emerge and are fully established. Apply water soluble fertilizer for blooming plants as soon as the seedlings are 4 inches high. An application of high phosphorus fertilizer just prior to blooming encourages large, brightly colored blooms. Water whenever the soil dries. Mulch around the base of the plant to keep the soil moist and reduce weeds if preferred, but realize that mulch may prevent the plant from spreading in future years. I prefer to let purple cone flower grow naturally to encourage spreading. Weed around the base of the plant to keep weeds at bay. Deadhead blooms as soon as they begin to fade to encourage new blooms and prolong the blooming season. With regular dead heading, purple cone flower will continue to bloom throughout the summer. Use cuttings for cut flowers. Echinacea makes a wonderful cut flower and adds a splash of color to mixed bouquets, but is equally as impressive in the garden. Allow the last blooms of the season to go to seed as echinacea self sows nicely. Although you can cut the foliage back once it has been killed by frost, these plants are attractive and hold their shape throughout the winter. I prefer to leave the foliage intact so it is easier to identify in the spring. Watch for young shoots to emerge around the base of the plant in early spring. Remove any debris and clip off old stalks to allow them to grow. Any seed heads that remain can be picked to harvest seeds. Although cold stratification is reportedly not required for germination, it does seem to increase the germination rate. You can harvest seeds in the fall, particularly if birds are a problem. Simply rub the seed head with your hands to loosen the seeds and plant them in a new location. Once established, purple coneflowers return each year in a larger clump making them a great addition to any perennial garden. These hardy plants transplant well and can be divided in the spring to create additional plantings. Be sure to dig deep and get the entire root ball if you choose to transplant echinacea. Water well until the plant is established in the new area. Pair purple coneflowers with yellow and orange rudbeckia for a dramatic display of color all summer long.